February 6 is Waitangi Day in NZ, and this year it fell on a Monday thus giving us a three day weekend. Waitangi Day celebrates the signing of a treaty between Maori and the British Crown in 1840. 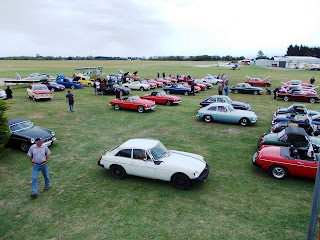 There were a lot of events on; one of them being the MG Car Club's national rally. 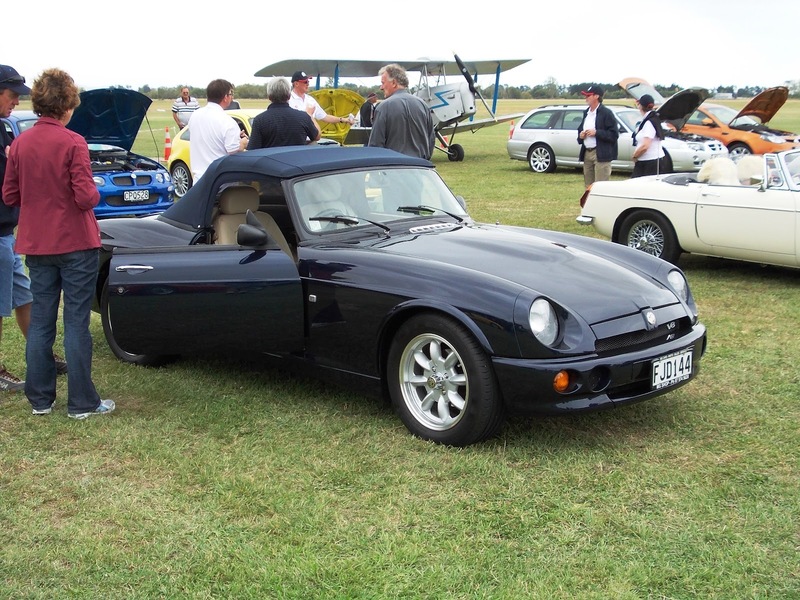 This was held in my hometown of Masterton with a public display at Hood Aerodrome on Saturday. An overall view of the event shows it was dominated by MGBs and the derivatives thereof. 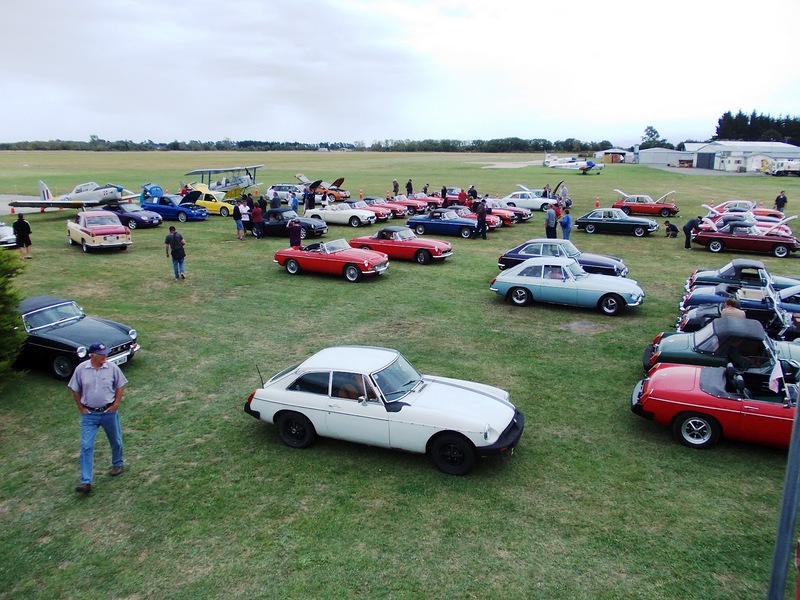 Hardly surprising really when not only were they the best selling MG model, but also the highest selling single model sports car of all time with over half a million produced. This 1965 "B" roadster is a fairly early model. They were introduced in 1962, though this one should have the five bearing crank which was introduced from September 1964.
and a 1971 on the right. 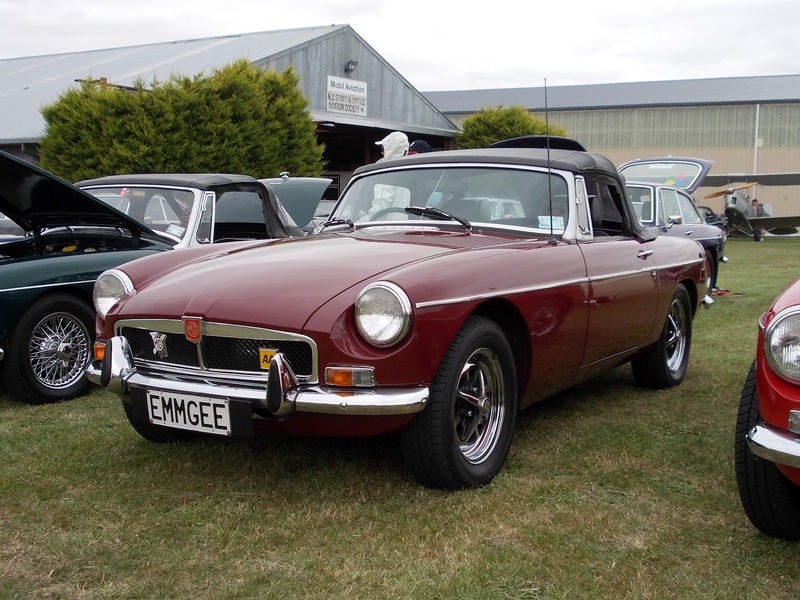 This 1967 model has aftermarket aluminium alloy wheels fitted. Not a bad idea when the original steel rims were only four inches. The optional wires were a little wider at four and a half inches although GT models had 5 inch rims. All synchromesh gearboxes were also introduced in late 1967 as was an option of automatic transmission. I can't imagine why anyone would buy a sports car and specify an auto. 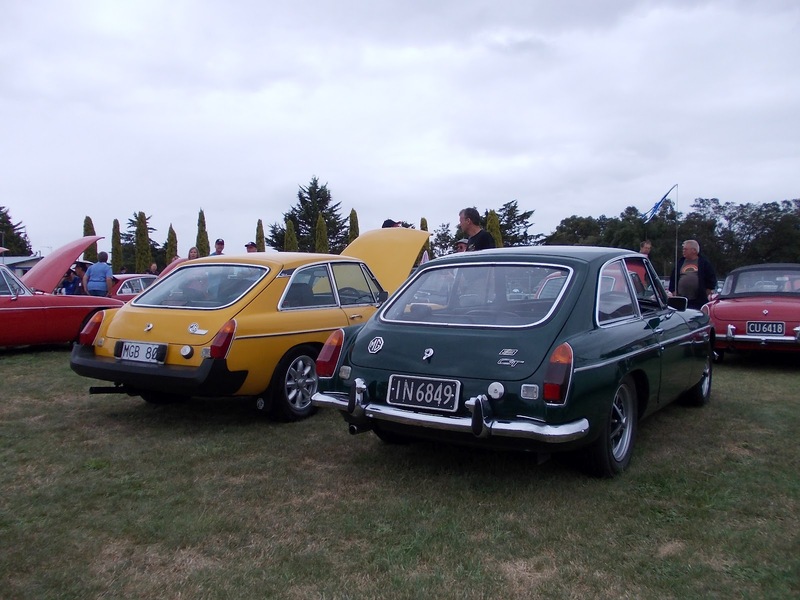 Apparently most buyers agreed as only around 2% were ordered with automatics and the option was withdrawn in 1973. Although chrome wires are the desired wheel, I quite like the Rostyles on this 1973 model. These wheels were standarrd from 1969, but chromed wires were still an option. 1973 was also the year in which the MG badged returned to the top of the grille, similar to the first models, except now the remainder of the grlle was black mesh instead of vertical polished bars. This would be one of the last models before the introduction of the raised ride height and the hidious plastic bumpers. 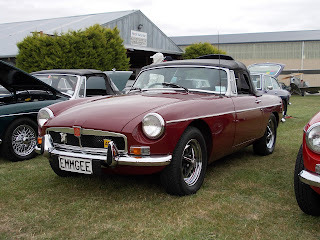 The bulge in the bonnet, with the chrome strip across it, identifies this as an MGC powered by the 3 litre 6 cylinder power plant. The heavier motor was said to be detrimental to the handling, but made a great high speed cruiser. This one is from 1968. 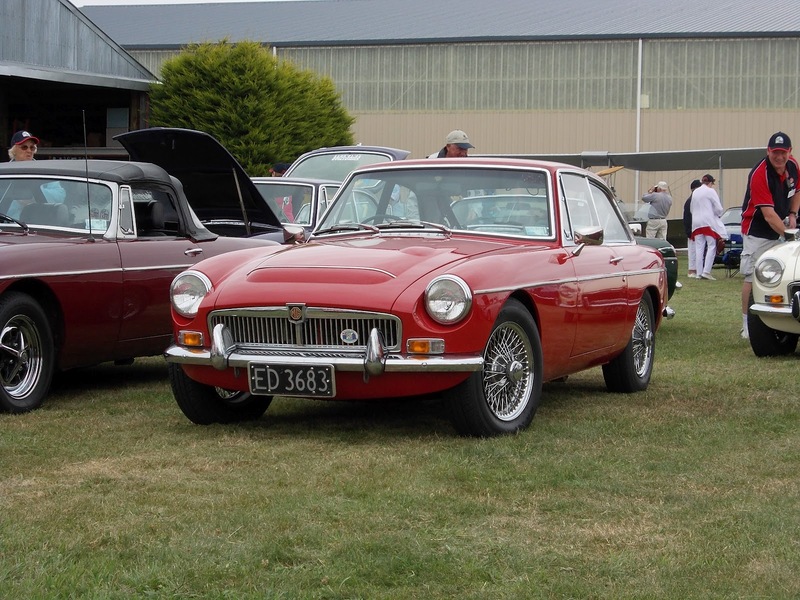 The MGC was introduced in 1967. Another MGC, this time a GT of 1969. 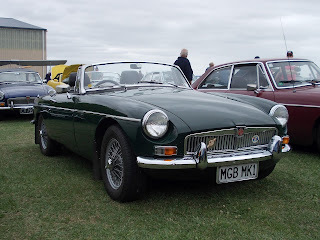 The last of the front engined MG sports cars, developed from the "B" series, were the MGRV8s like this 1995 example. A line-up of "Bs" in front of a DH82 Tiger Moth. Photos of other MG models at the event will appear in a future blog. I have since learnt that this lineup cosisted entirely of Brayshaw MGBs. Brayshaw assembled "Bs" in NZ some years after UK production had ended...See attached comments fron Neil Courtney. 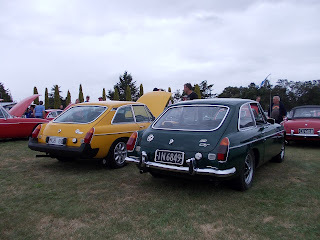 The "Line up of B's" in your last photograph is actually a line up of Brayshaw MGB's. 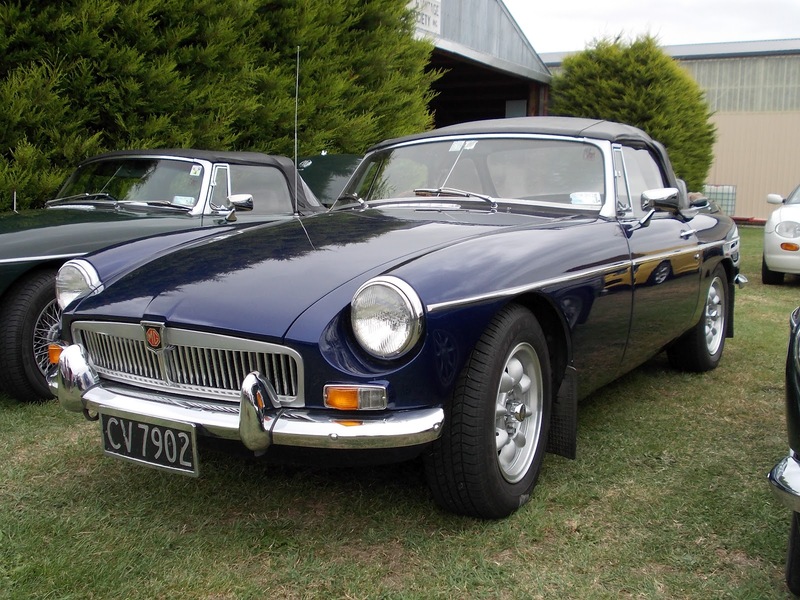 Rod Brashaw acquired the license to produce 20 (I think) new MGB's after the production ceased in 1980. 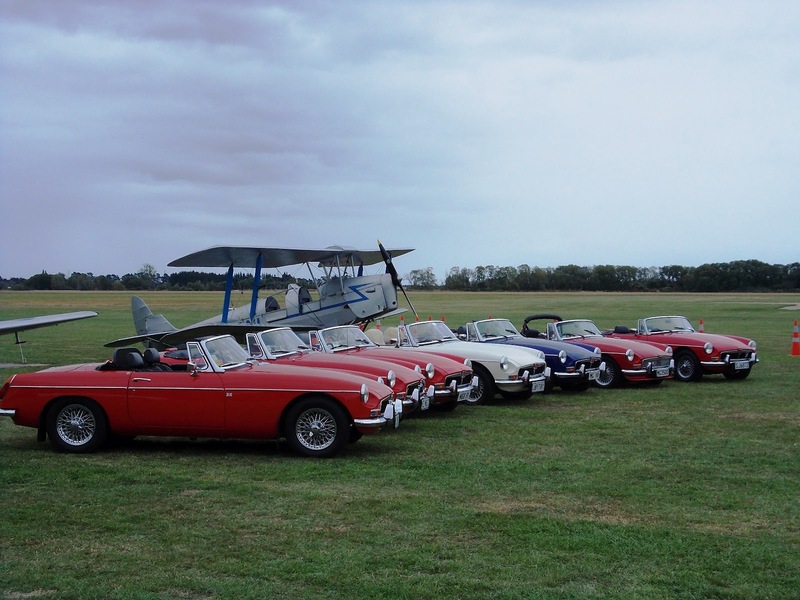 He built them using Heritage MGB shells and Rover V8 engines. The last was built in 1991, I think. 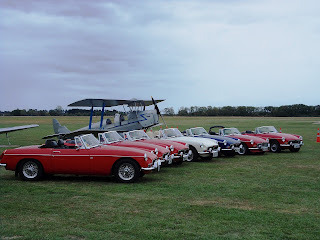 The picture shows 7 of the 8 produced, and are the newest MGB's in the world. Correction. 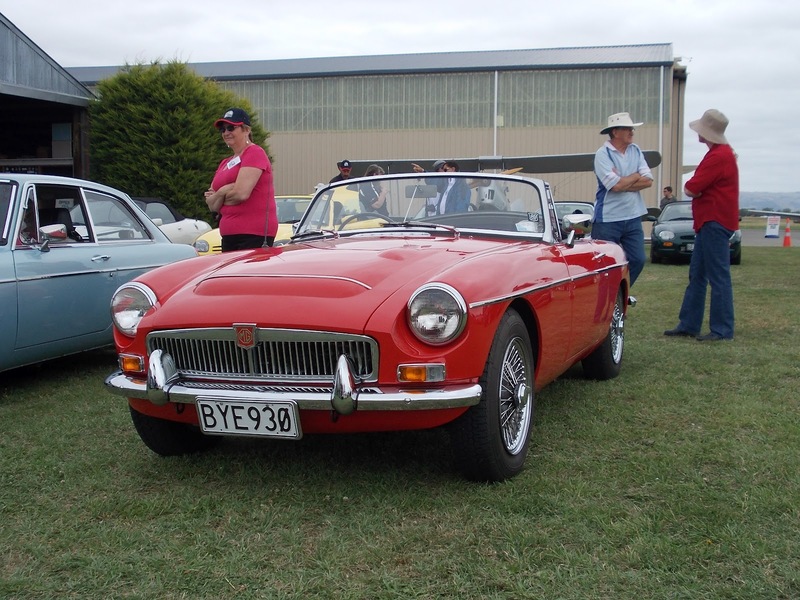 The Brayshaw cars were built between 1988 and 1992, and only 3 were V8's.